Chios is the fifth largest of the Greek islands, situated in the Aegean Sea, seven kilometres (five miles) off the Asia Minor coast. 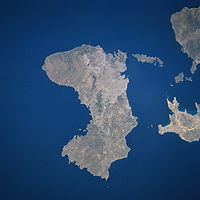 The island is separated from Turkey by the Chios Strait. The island is noted for its strong merchant shipping community, its unique mastic gum and its medieval villages. The 11th century monastery of “Nea Moni”, a UNESCO World Heritage Site, is located on the island. Administratively the island forms a separate municipality within the Chios regional unit, which is part of the North Aegean region. The principal town of the island and seat of the municipality is Chios (town). Locals refer to Chios town as "Chora" ("Χώρα" literally means land or country, but usually refers to the capital or a settlement at the highest point of a Greek island).